10 What else should you expect? 11 What Can Physiotherapy Offer? Recall the different stages of dementia and recognise how they apply to the person you are caring for. 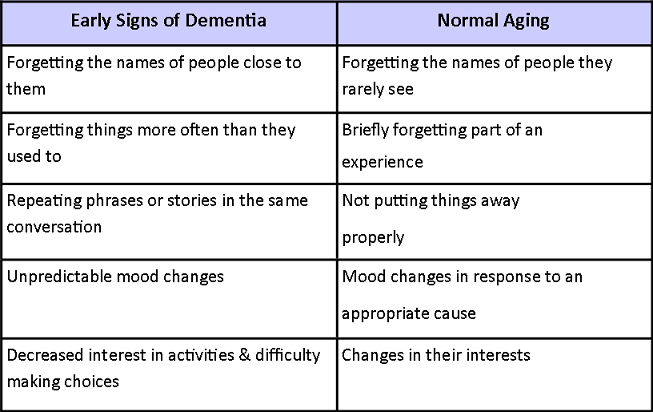 Differentiate between the ‘normal’ aging process and the typical signs and symptoms of dementia. Identify strategies and techniques that enable you to help someone with dementia to optimize their independence and quality of life. Identify dementia services and resources that would be appropriate for the different stages of dementia. Relate the information in this resource to your individual circumstances. A print version of this website is available here. To open this document click on this link and then the file name File:Carers Guide to Dementia PDF-1.pdf. Dementia neurodegenerative disease, not part of the normal aging process, with no known cure. It is characterised by changes in reasoning, memory, comprehension, problem solving, and/or attention. 750,000 people are living with dementia in the UK at present. This number is expected to double over the next 30 years. As of 2010, 35.6 million people worldwide have dementia . 25% of hospital beds are occupied by people over the age of 65 with dementia . There are many types of dementia. Below is a list of the most common forms of dementia with their prevelance percentages. In some cases, the cause may be another disease (eg. Huntington's disease) or from a head injury. •Dementia with Alzheimer's disease 62%: this is the most common form of dementia. Loss of nerve tissue along with changes in the chemistry and structure of the brain lead to the death of brain cells. •Vascular dementia 17%: most common after a stroke or a series of small strokes. The blood supply and oxygen supply to the brain is effected causing brain cells to die. The person may start to forget or have trouble planning ahead. Balance problems can also occur. •Dementia with Lewy Bodies 4%: caused by the breakdown of brain tissue following the formation of abnormal structures in nerve cells. The person will move slower and fall more often. •Fronto-temporal dementia 2%: damage to the front part of the brain causes personality and behaviour changes. Memory is less likely to be affected in the early stages. •Mixed dementia 10%: has the characteristics of both Alzheimer's Disease and vascular dementia. The person will have mixture of symptoms from both. •Korsakoff's Syndrome: caused by heavy drinking over a long period that leads to brain cell death and short-term memory loss. Although not strictly classified as a dementia, it is included here as symptoms are similar. As explained above Alzheimer's Disease is the most common form of dementia with approximately 62% of dementia cases involving Alzheimer's Disease equating to more than 520,000 people in the UK. During the course of the disease proteins called 'plaques' and 'tangles' build up within the nerve cells of the brain causing death to nerve cells and loss of brain tissue. There is also a shortage of neurotransmitters causing ineffective nerve conduction. As these 'plaques' and 'tangles' increase in numbers so does the severity of symptoms with different areas of the brain being involved. Stage 1 - No impairment - The person does not experience memory, movement or cognitive difficulties. Stage 3 - Mild Cognitive Decline - Family and friends begin noticing cognitive difficulties at this stage, there are common difficulties including; difficulties finidng names, difficulties retaining new information, social and work interactions are challenging, losing and misplacing valuable items and difficulty planning or organising. Stage 4 - Moderate Cognitive Decline - At this stage clear symptoms are evident in several areas; forgetful of recent events, difficulty with challenging mental arithmetic, complex planning tasks are nearly impossible, forgetful of the persons own history, mood swings, withdrawn and frustration set in. Stage 5 - Moderately Severe Cognitive Decline - Day-to-day activites become a challenge, recaling addresses, phone number, orientation to place, choosing clothing and remembering significant details about themselves all decline into almost impossible tasks however eating and toileting are still independent. Stage 6 - Severe Cognitive Decline - Memory and personality changes worsen and individuals need help with daily activites. Individuals may; lose awareness of recent experiences, difficulty remembering their own name, unable to remember familiar faces, need help dressing, making mistakes with buttons, major changes in sleep patters, need help with toiletig including incontinence, major personality changes and wandering becomes commonplace with a subsequent increase in falls. Hallucinations and delusions may also become troubling for the person with dementia. Stage 7 - Very Severe Cognitive Decline - In this final stage of the disease process individuals lose the ability to respond to their environments, all daily activites need to be assisted, muscles grow rigid and swallowing becomes impaired. Most people who develop Alzheimer's Disease are over the age of 65 but younger people can develop the disease, currently it is estimated the 40,000 under the age of 65 in the UK have early-onset Alzheimer's. This is the second most common type of dementia affecting approximately 150,000 people in the UK. In vascualr dementia the person suffers similar symptoms to other types of dementia, such as Alzheimer's Disease, but the cause of the cognitive decline is different. These symptoms occur when the brain is damaged because of problems with blood supply to the brain. Nerve cells need perfusion, just like any other cell in the body, and they die when blood does not reach them. The death of the nerve cells then causes the brain to decrease in abilities and performance leading to dementia. There are different types of vascualr dementia. A stroke happens when there is a sudden cut off in the blood supply to the brain causing death to a large are of the brain, depending on the location the symptoms can vary greatly. Not everyone who has a stoke will develop dementia but around 20% do and it will develop within 6 months of the cerebrovascular event. This occurs when a single stroke is large enough to cause cognitive impairment or when several strokes cause cognitive impairment. This is the most common form of vascualr dementia, the blood vessels which lie deep within the brain tissue become sclerotic causing impaired circulation to smaller nerves. These nerves which are damaged are known as the white matter and lie deeper within the brain so the symptoms of this type of dementia are different. Age is the strongest risk factor with risk doubling every 5 years over the age of 65. Dementia with Lewy Bodies(DLB) shares symptoms of Alzheimer's Disease and Parkinson's Disease accounting for approximately 10% of all dementia cases. Lewy bodies are tiny deposits of protein in nerve cells and has been linked to a reduction in acetylcholine and dopamine. Over time there is a progressive death in the nerve cells and loss of brain tissue. Depending on where the Lewy bodies are located the symptoms can vary, if they are deep in the brain then movement symptoms are likely and if they are in the outer layers of the brain then cognitive problems arise. Movement and cognitive problems can occur together with around 33% of Parkinson's disease patients developing dementia later on in the disease process. Around 66% of DLB sufferers having movement disorder symptoms at some stage. The initial symptoms of DLB include difficulties with attention and alertness and fluctuate greatly throughout the day. There may be difficulties percieving objects in three dimensions and judging distances along with planning and organising. The symptoms are very individual, in keeping with the pathological process, and can vary day-to-day. Visual hallucinations and delusions occur greatly in DLB patients and can be very distressing, they can be very detailed in nature and need to be handled sensitively. Up to two thirds of DLB patients have movement disorders in keeping with Parkinsonism such as; rigidity, tremor, reduced blink rate, lack of facial expression and stooped postures. These movement symptoms are why persons with DLB are prone to falls. At night symptoms persist with restless legs and impaired REM sleep leading to fatigue during the day. As DLB is progressive symptoms worsen and cognitive decline sets in with similar cognitive difficulties as mid-late stage Alzheimer's dementia. On average someone might live for 8 years after DLB symptoms onset. 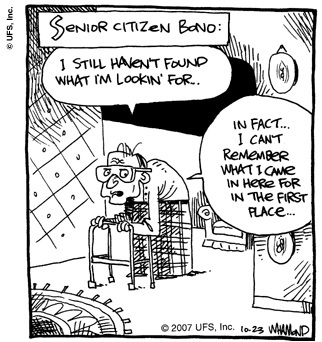 It is sometimes difficult to tell the difference between what is normal aging and what is the early onset of dementia. You may be concerned that an elderly relative or friend is developing dementia. So, how will you know? In normal aging, the term Mild Cognitive Impairment describes problems with mental abilities such as thinking, knowing and remembering. People with mild cognitive impairment often have difficulties with day-to-day memory, however these signs do not mean that the person is suffering from dementia . 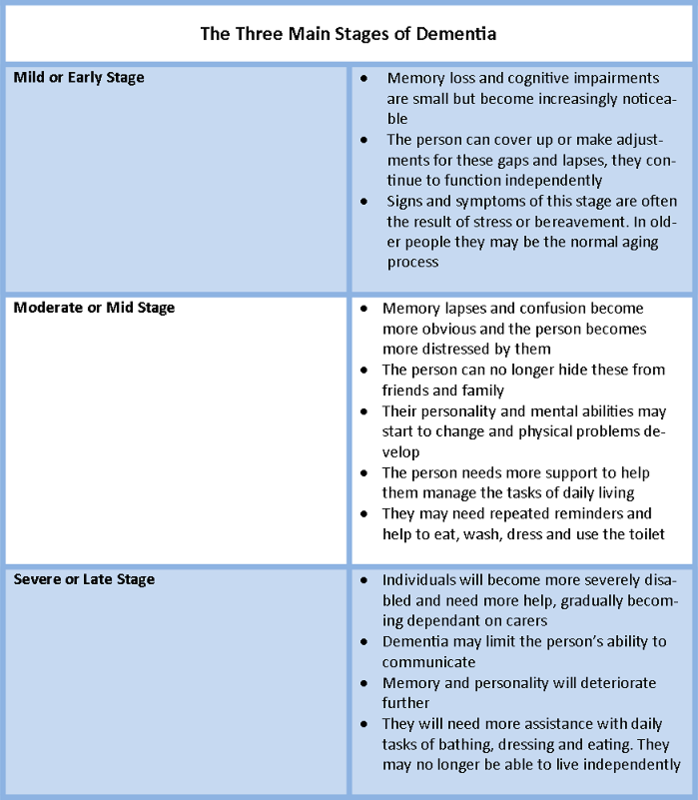 You can use this table to compare the signs of early onset dementia and normal waging. If you are going to care for someone with dementia, it is important to get as much information about the disease as possible. Perhaps you are the carer to a friend or relative, with a recent diagnosis of dementia. You probably have lots of questions about the future, you may be anxious or frightened about the changes that will occur as the disease develops. This section provides information to help you understand what happens at the various stages of dementia and why. People with dementia may suffer from depression and/or behavioural problems. They may often become annoyed easily or act aggressively towards a family member or friend. Behaviour management is one strategy that is used to decrease depression in people with dementia and can be carried out by carers. Reducing the repitition of words, managing aggression and the eating behaviours in people with dementia has a positive effect on their behaviour and overall well-being . Mood is usually affected in individuals coping with dementia. Individuals can often become flustered and distressed and in some cases can become aggressive and depressed. Regular movement will balance their mood help to reduce depression and keep them calm. 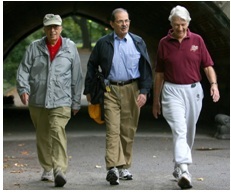 Activity can help improve sleep pattern which can often be disturbed by dementia. Regular routines can include household activities, exercise classes, resistance training and stretching . Physiotherapists use movement of the body to help bring about physical, psychological and social well-being. Physiotherapy plays an important role in promoting and maintaining mobility in people with dementia as well as improving their quality of life and reducing the burden of care. Poor balance is known to increase the risk of falls. Physiotherapy can lower a persons their risk of falling by giving the person with dementia exercises specifically for improving their balance. Falls prevention programmes can be set up to reduce the persons risk of falls as well as their fear of falling and keep them safe and independent at home. .....The risk of falling increases if the person is also suffering from dementia . Maintaining their independence and confidence. The ultimate aim is to reduce the fear of falling and maintain function. More information about falls can be found here. Exercise prevents and reduces the risk of developing heart conditions. Exercise is also recommended in people with Type 2 Diabetes . Exercise has also been linked with improving bone density and preventing osteoporosis . This is especially important in women. Exercise should be weight bearing, this means any exercise where the hands and feet support your weight . Examples are walking, dancing and lifting weights. Although cycling and swimming are good forms of exercise they are not weight bearing and so will not help improve bone density. Taking part in physical exercise also enhances mood and improve mental function . This in turn may decrease the need for management with drugs & medications . Strengthening exercises: to increase bone strength and decrease risk of osteoporosis. Balance: to prevent falls and increase confidence in everyday tasks. Flexibility & stretching: to prevent muscle tightening and make movement easier. Maintenance of independence: to stay as involved as possible for as long as possible in everyday life. Postural management: Regular change in body position is essential for comfort and prevention of poor posture which may lead to muscle tightness and spasms, decreased movement of joints and pressure sores . A physiotherapist will also assess everyday activities such as walking, going up and down stairs, getting out of a chair and getting in and out of bed. If someone is struggling to do any of these activiites a physiotherapist can provide appropriate exercises. Physiotherapy can help manage pain. Pain affects mental function, motivation and will affect how the person with dementia responds to any rehabilitation programme. People living with dementia who have difficulty speaking will not be able to easily report pain. These people are at risk of receiving inadequate medication and treatment of pain. It is important that pain is addressed before and during therapy to allow for better rehabilitation . When caring for someone with dementia it is important to help them remain as independent and as healthy as possible. They should continue to enjoy their usual activities as the better they feel the more they can enjoy life. By learning as much as you can about the disease, you will know what to expect and be better able to handle the challenges associated with dementia. By reading this website you have already taken the first step. Here are a few things that you can do to make life easier for both yourself and the patient with dementia. Predictability can be calming. This may help to relax the person. 1. Give the person a role/task; doing the washing up, peeling the vegetables, pairing socks. 2. Do less for them while encouraging them to do more for themselves. 3. If motivation is an issue, make the tasks functional: walk to the kitchen to get a drink instead of carrying it to them. 4. If the person is wandering around or restless, then think about why this might be happening. Some people walk because they are bored, have excess energy or it may be a reaction to an hallucination. By doing as much as possible by themselves, they will be more likely to retain their self esteem. If it is realistic to do so, take the person for a walk each day. It will burn off energy and the fresh air will do you both good. Other activities can include gardening, baking, listening to music, singing, dancing or playing cards. What is important is that the person is participating in an activity that makes him/her feel useful. The home can be full of potential hazards contributing to falls. Make sure there is nothing around the house that the person could trip on. For example carpets, rugs, doorway thresholds. 1. Keep commands simple- one request at a time. 2. Allow extra time for a response to your question before repeating it. 3. If the individual doesn't appear to understand your request, try rephrasing it. 4. Don't chat whilst the person is trying to perform a task, this will likely be a distraction. 5. Make sure communication problems are not due to problems with the persons sight or hearing. Check that glasses and hearing aids are in good working order. 6. Use names and explain phrases where possible, such as "Your son, John." Touch can be used to help movement during walking by placing a hand on their shoulder or by taking their hand. Sounds can provide an extra stimulation to encourage normal movement or to trigger a response to an instruction. Walking can improve by providing an rhythm, for example counting aloud or by playing music with a rhythm the person can walk to. Visual communication can be used to show tasks or give instructions. When performing exercises it is better to show the exercise than to say the instructions . Use this page to find organisations that offer help and support. Familly members or those caring for a person with dementia are often subject to extreme stress. Remember you cannot help someone else if you do not help yourself first! Join a caregiver support group: This can provide emotional support from others in a similar situation, provide education and also give you connections to local useful resources. A charity that works across all age ranges and all aspects of mental health. Type “Dementia” in to the search box for helpful information and publications relating to dementia. The Alzheimer's Society. Dementia UK, The full report 2007: This document is an in-depth report on dementia and Alzheimer's in the United Kingdom. Carers UK is a charity set up to help carers. This website provides information and advice about caring, alongside practical and emotional support for carers. There is an online community network where you can chat online with other carers and share your experiences. This is an international carers support network that provides support and friendship between carers online. Alzheimer's and Dementia Support Services (ADSS) is a charity that provides support for carers including a 24 hour help line (0800 500 3014). Calls are free from a landline within the UK but a charge may be incurred from moblies.